Imagine a barren, expanse of sandy desert, stretching out for thousand miles around you. Imagine this place being so dry that only a handful of plants and animals can survive off the land. Even humans, unarguably the Earth’s most resilient predator, have trouble living in this place. It might sound like something out of a science-fiction novel, but this kind of place is very real. 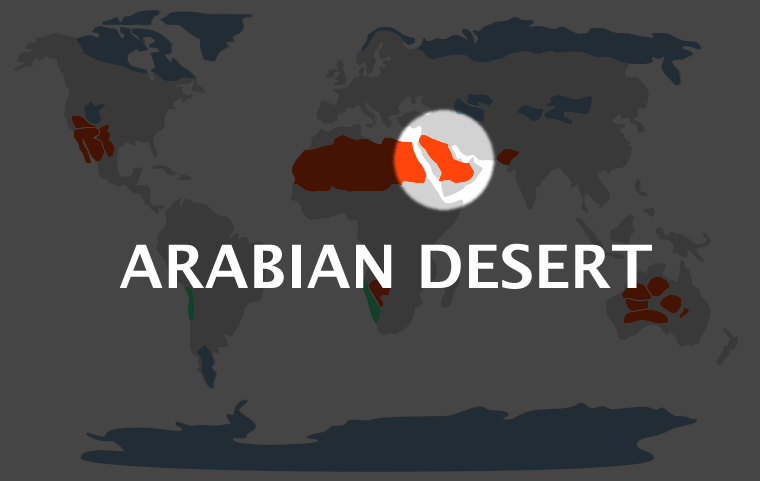 Called the Arabian Desert, this vast area of dry wilderness has always been infamously known for many millennia due to its harsh, unforgiving climate. As the name suggests, the Arabian Desert is located in the Arabian Peninsula. In fact, it actually covers much of the entire Peninsula– it’s nearly 900,000 square miles! It is so large that most people consider it as impassable. The Arabian Desert shares both political and geographical borders with multiple countries like Saudi Arabia, Yemen (which it borders on the southwest), and Oman (east). 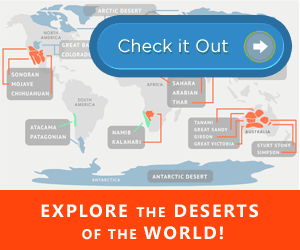 The Desert also extends into other neighboring countries such as Kuwait, Jordan, Egypt, and Iraq. But don’t let the “desert” in its name fool you. The Arabian Desert is not a mere flat expanse of sand. There are mountains in the area, most noticeably along its borders. These mountain ranges roughly define where the Desert starts and ends. The highest point in the desert is Mount Al-Nabi Shu’ayb (with an elevation of nearly 12,400 feet) closely followed by Mount Al-Sham (elevation of roughly 10,000 feet). If you zoom in on a map of the area, you can see that within those ranges lie the Rub’al-Khali, the largest continuous expanse of sand in the whole world. Most of the terrain in the Rub’al-Khali is covered with gigantic sand dunes, but along its middle can be found hardened areas made out of minerals. These were once the sites of the lakes that existed in the place more than two thousand years ago. The climate in the Arabian Desert is generally hot all year round, with very little rainfall. During the summer, the temperature can go anywhere as high as 40 degrees up to 46 degrees Celsius. But the high temperature alone is not the only climatic factor that makes the Arabian Desert unsuitable for comfortable human living. The climate actually goes into both extremes, with sizzling hot temperatures during the day and excruciatingly cold temperatures at night. Having below freezing temperature at night time is not unheard of, especially during winter. Despite the extreme temperatures, some plants and animals have made the Arabian Desert their home. These flora and fauna have over the years adapted to the harsh environment. For example, local flora like date palms, daisy, mustard, and iris can survive with very little water. Their roots are also thinner and are spread out more than other plants (so as to collect as much water as they can from the soil, especially in the brief periods of rain). Animals that live and thrive in the Desert include locusts, spiders, scorpions, and vipers. There used to be a large population of mammals (e.g. ibex and gazelles) in the area, but their numbers have already dwindled due to hunting. The only remaining mammal that are in abundance is the camel, which are herded and protected by the Bedouins. For many years, the nomadic Bedouins have been the constant inhabitants of the Arabian Desert. The name, when translated, literally means “desert dweller.” These people live off the land if they can, often breeding camels and engaging in agriculture on whatever fertile land they can find. These people have a patriarchal hierarchy, with many groups led by a single leader called a Sheikh. Familial ties are highly valued. Visitors are treated well; it is said that any visitor is entitled to three days of free meals and board in a welcoming Bedouin’s tent. In olden times, various Bedouin tribes are often at war with each other over grazing grounds and other such resources. However, as the modern age caught up with them, these people have slowly made modifications to their lifestyle. Modern transportation allowed some Bedouins to access education and other outside resources and culture.